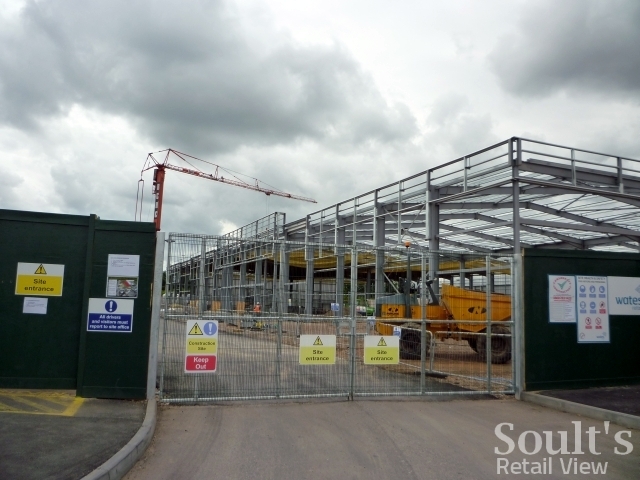 Following the confirmation, in April, that John Lewis will indeed be opening one of its ‘At Home’ stores in Tamworth, work on site seems to be proceeding rapidly ahead of the Ventura Park store’s planned autumn opening. 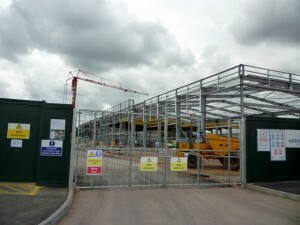 Screens around the site make it difficult to get a good photograph, but when I dropped by earlier today the steel frame looked to be largely in place. Meanwhile, the vast scale of the 42,000 sq ft shop is already apparent, with the premises dominating the main route into the retail park (below). 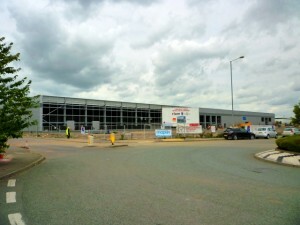 The Tamworth store will be the fifth John Lewis at Home shop to open since the concept launched, in Poole, in October 2009, and one of two (with Chester) to open this year. 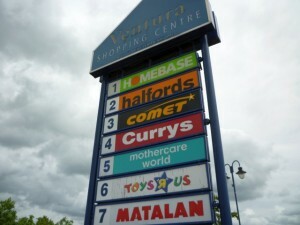 Two more stores are scheduled to open in 2012: one in Newbury, and another – announced this week – in Ashford. 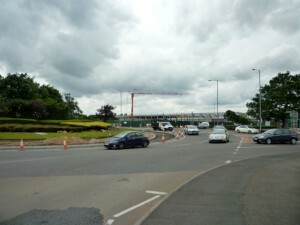 However, work on the ‘at Home’ store that was originally announced for Exeter city centre appears to be on hold, with reports that a full-line John Lewis department store is now planned for the site instead. Wednesday’s Ashford announcement cites all the other future openings, yet any mention of the Exeter store is noticeably absent. 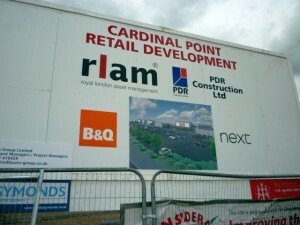 Barely 100m from the Tamworth John Lewis, work is also progressing on the separate Cardinal Point retail development, which will house new stores for B&Q, Next and Maplin. 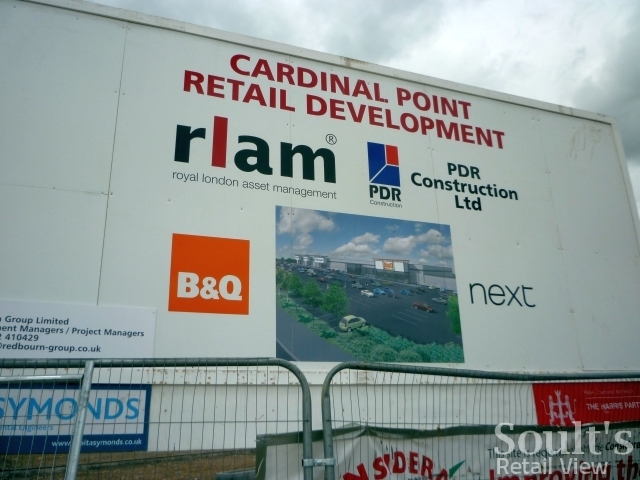 These developments add to a sprawling retail cluster that already includes a large Sainsbury’s, Asda and M&S, as well as more than twenty other retail park staples such as Boots, Outfit, Homebase and Hobbycraft. However, the way in which Ventura Park has grown up over the years means that it comprises half a dozen distinct, but adjacent, retail zones, each with its own car park. 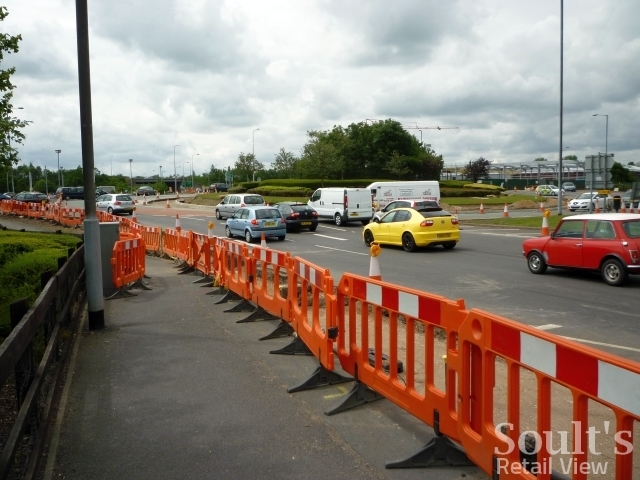 This, and the distinctly unfriendly pedestrian environment, means that shoppers will often move between two or three different car parks over the course of one visit, adding to the traffic pressures. 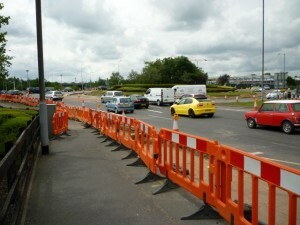 I was therefore relieved to see that improvements are being made to Ventura Park’s overburdened road system, which – in a case of very bad planning – also includes the main access route between Tamworth and the A5 dual carriageway. 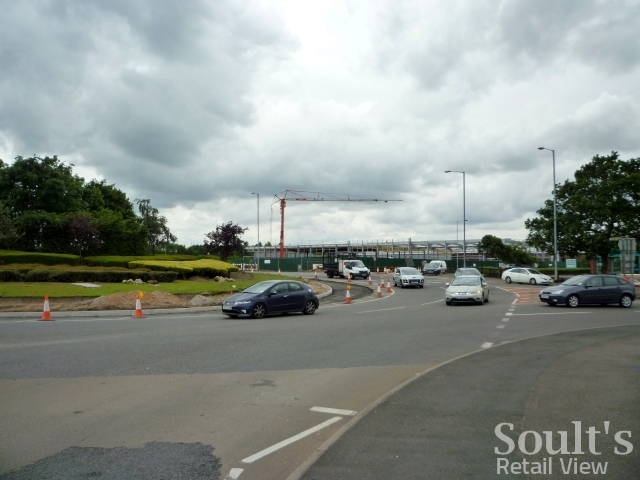 With the John Lewis and B&Q developments likely to attract even more visitors to what is already one of the Midlands’ busiest retail parks, these improvements surely can’t come soon enough. I agree, traffic congeston at Ventura Park can be a nightmare, 4pm Sunday definitely a time to avoid!